Denavit-Hartenberg parameters are used during designation of transformation matrix. Transformation matrix defines transformation from coordinates system “i” to coordinates system “i-1”. Forward kinematics of RRR manipulator. RRR manipulator is a model of robot which contains three rotary joints. In first step coordinates systems are assigned to manipulator joints. Assigning of coordinates systems is made via Denavit-Hartenberg notation. At second step table with Denavit-Hartenberg’s parameters is written. Robot has three joints then number of coordinates systems is equal to three. General form of transformation matrix is used. Transformation matrices between consecutive coordinates systems are written. As a result three transformation matrices are obtained. 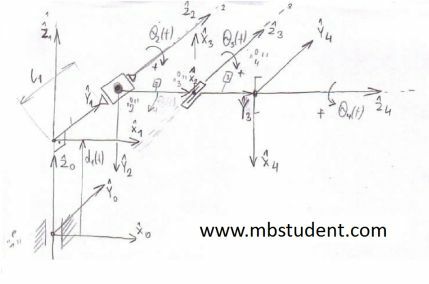 Transformation matrix which describes any position from last coordinates system in base coordinates system, is obtained by multiplying transformation matrices between consecutive coordinates systems. Robot has one prismatic joint and three rotary joints in its construction. Table with Denavit-Hartenberg parameters is written for robot. Because robot has four joint, four transformation matrix are obtained. Each transformation matrix is for two consecutive coordinates systems. To write transformation matrix between coordinate system a general form of transformation matrix is used. Transformation matrix which describes any position from last coordinates system in base coordinates system, is obtained by multiplying transformation matrices between consecutive coordinates systems. Robot has two prismatic joints and two rotary joints in its construction. Table with Denavit-Hartenberg parameters is written for robot. Because robot has four joint, four transformation matrix are obtained. Each transformation matrix is for two consecutive coordinates systems. To write transformation matrix between coordinate system a general form of transformation matrix is used. 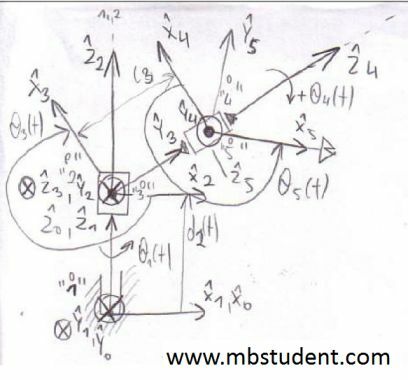 Transformation matrix which describes any position from last coordinates system in base coordinates system, is obtained by multiplying transformation matrices between consecutive coordinates systems. Considered model of robot has four rotary joints and one prismatic joint. Coordinates systems are assigned to robot’s construction via Denavit-Hartenberg notation. 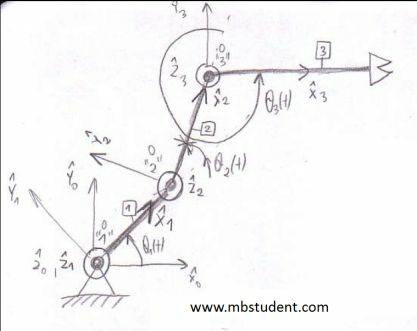 Because robot has five joints as a result five coordinates systems are obtained. Between two consecutive coordinates systems transformation matrix is designated. Robot has five joints so five transformation matrices are obtained. 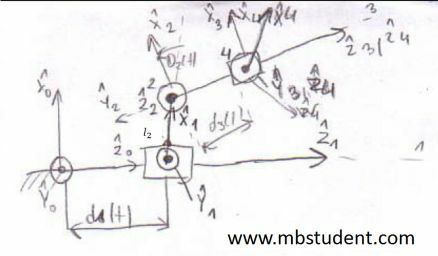 Transformation matrix which describes any position from last coordinates system in base coordinates system, is obtained by multiplying transformation matrices between consecutive coordinates systems.